Place all the vegetables in a large heavy-bottomed saucepan with a dash of olive oil, ginger, garlic, chili, basil stalks, coriander seeds and cloves. Season with the pepper and a little salt. Cook over a low heat for 10 to 15 minutes until softened, stirring every so often. Add all the tomatoes and 1 1/2 cups of cold water. Bring to boil and simmer gently until the sauce reduces by half. Add the basil leaves, then put the sauce in a food processor or with a hand blender and push it through a sieve twice. Put the sauce into a clean pan and add the vinegar and the sugar. 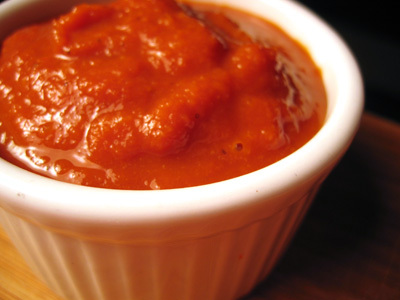 Place the sauce on the heat and simmer until it reduces and thickens to the consistency of tomato ketchup. You can add seasoning to taste. Refrigerate until needed. Your ketchup should keep for about 6 months.